JitterBlast is an intense total-body dance fitness workout that mixes kicking, plyometric movement, and core building exercises – which shape muscle and improve balance, flexibility, and daily energy levels. The program utilizes interval-style training designed for burning calories and cardiovascular health. JitterBlast uses high-energy moves from Swing dances like Lindy Hop and Charleston, and vintage Jazz, with some classic Hollywood Film dance moves thrown in. 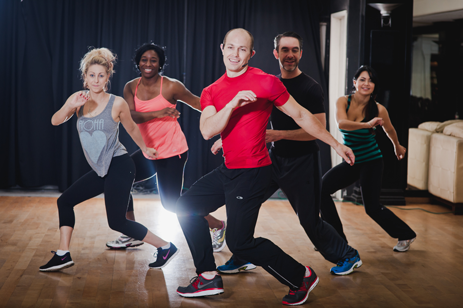 Learning how to dance to high-energy swing music, making an intense workout more of a dance party than a chore. Without knowing it, you will be learning a foundation of technique in swing and jazz dance that will inspire even professionally trained dancers. There’s no partner required! JitterBlast is a solo dance format. 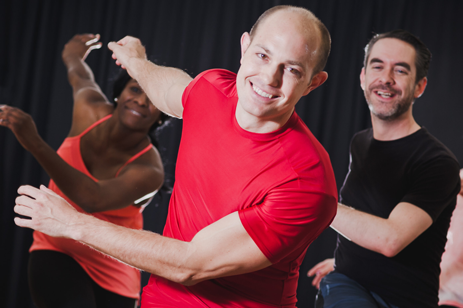 Because this is a dance fitness program, it’s not about getting the moves right. It’s about harnessing the Jitterbug spirit and just having a good time. What you put into the workout is what you get out of it. This is an environment welcome to all ages, genders, fitness levels and dance abilities. The only requirement is your willingness to have fun!